Niagara-on-the-Lake is a gorgeous town about a half hour scenic drive along the Niagara River. 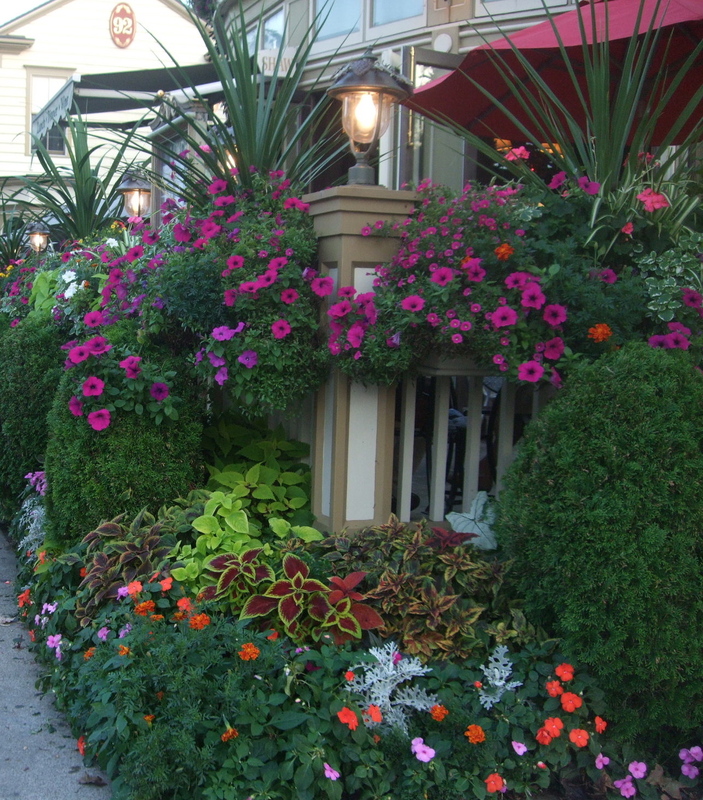 Beautiful flowers adorn street corners, shops, restaurants and parks. One could spend an entire day poking around in cute shops, dining, attending the theatre festival, and soaking up history. 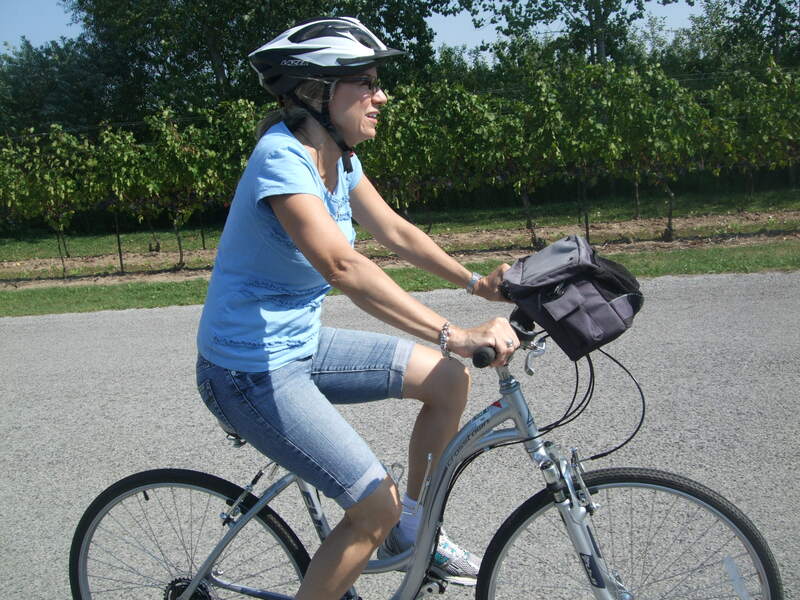 We, however, took a wrong turn after the first wine tasting and peddled off the beaten path through miles of neatly laid out farm roads with dozens of wineries. 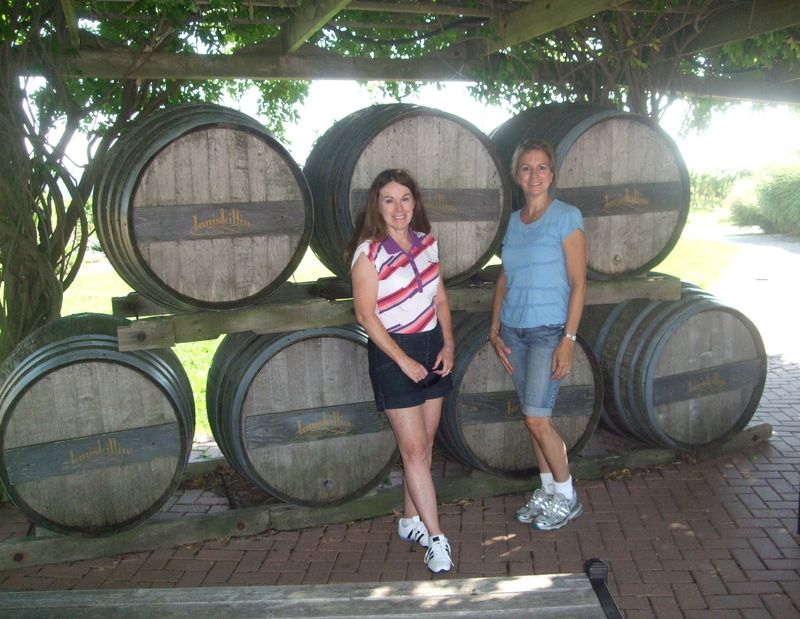 My favorite was Peller Estates. We sweaty bicyclists looked out of place at the impressive, upscale winery, but the people treated us like valued clients. After offering us much-needed water, Peller’s vintner, Dale, provided a free wine tasting thanks to a coupon provided by our B&B inn. Dale served several varieties of reds, whites, and dessert wines. “Ice Wine” is a new term for me. Dale explained that grapes are harvested only after 8-10 freezes in the middle of winter at midnight so that the grapes remain frozen as they are pressed. This creates the world’s sweetest wine. 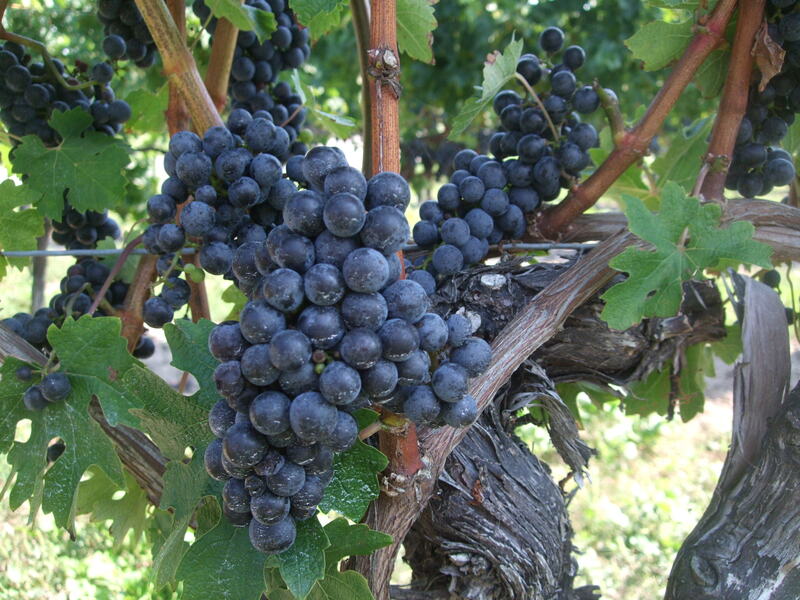 Each grape produces one drop of juice, making the resulting ice wine expensive––$50-$90+ per bottle. 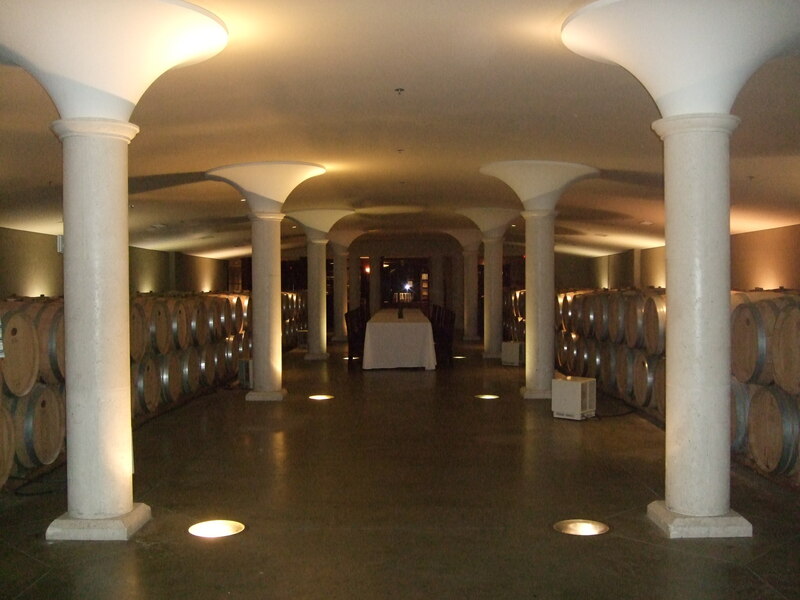 We then joined Dale’s tour to the vineyards and into the wine cellar. (A cool reprieve from the summer heat.) He demonstrated the proper way to sip a sweet wine: tuck the tip of your tongue behind your bottom teeth and let the wine sit on the middle of your tongue, breath air over the wine to get your sense of smell involved, swallow. The founders of the Peller Estates in 1927 were among the first to identify the Niagara peninsula has having the perfect climate for growing grapes; cold enough in the winter and hot enough in the summer. In 1969 they helped establish the wine trade on the peninsula. Today they’re working to change arcane prohibition laws against transporting wine outside its home province. A few vineyards have up-scale restaurants on the premises, but we couldn’t find them at lunch time. We settled for a cheese and fruit plate at Inniskillin Wines. 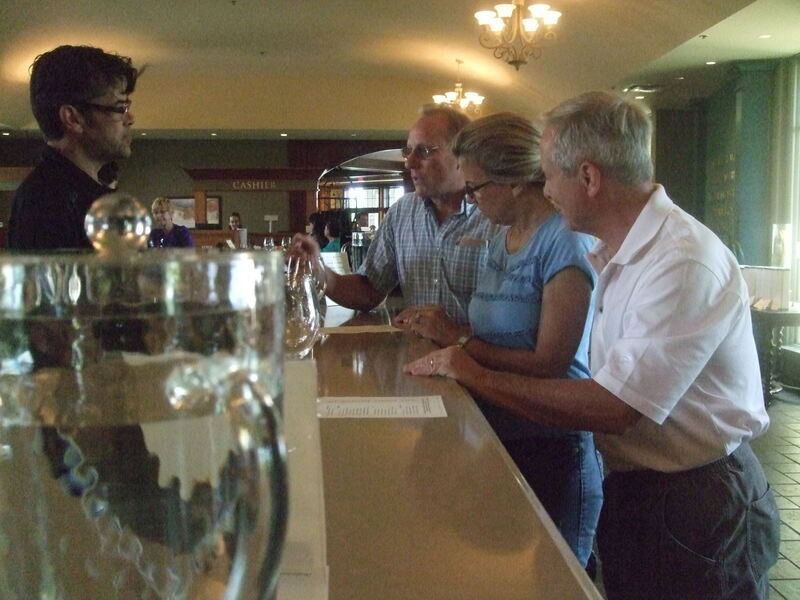 The wine samples at Inniskillin were more expensive and the staff less friendly, so we moved on. After a few more wine samplings, we peddled into Reif Estate. Feeling quite giddy, Donna and I asked Allen for a free tasting. He agreed and poured the cheaper varieties, but after a few laughs, he brought out the ice wine. Yum. He suggests we serve the expensive ice wine sparingly: drizzle it into the ricotta on a cannoli and let it soak in; or grill a peach, drizzle with the sweet wine, and add a dollop of vanilla ice cream. In the late afternoon, we turned in our bikes to walk the streets of Niagara-on-the-Lake and found an inviting place for dinner, The Irish Harp Pub. Good fish and chips and great music. Later, we stopped at an ice cream shop which also advertised poutine. I asked what poutine was and a customer effusively described it as a popular Canadian treat from Quebec––French fries and cheese curds, topped with hot brown gravy which makes the cheese gooey and delicious. Eeyew! Maybe it would sound appetizing if I didn’t have a butter pecan cone in my hand at the time. 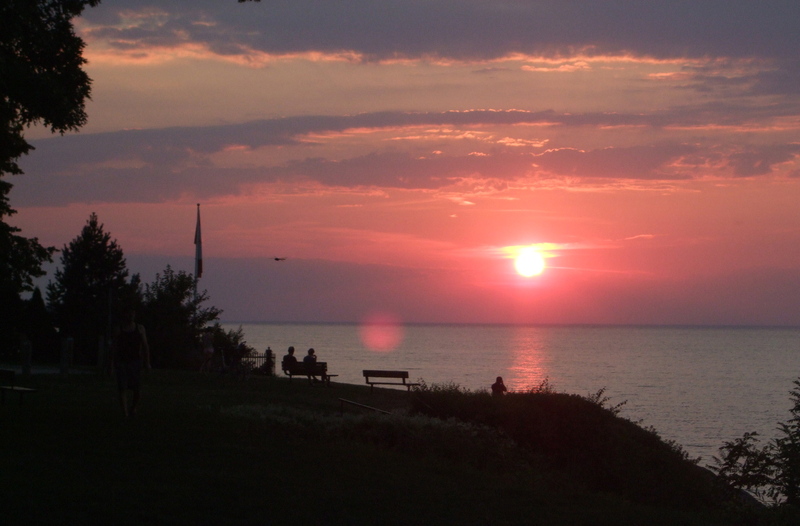 We thoroughly enjoyed our visit to the Niagara peninsula and closed out the day with achy muscles, a gorgeous sunset over Lake Ontario and a bottle of sweet Gewurztraminer Riesling. I had friends who lived in Niagara on the Lake for awhile and now deeply regret never visiting. The flowers are stupendous!